A subcompact SUV that’s big on style. Put on a happy face: 2017 Fiat 500X. 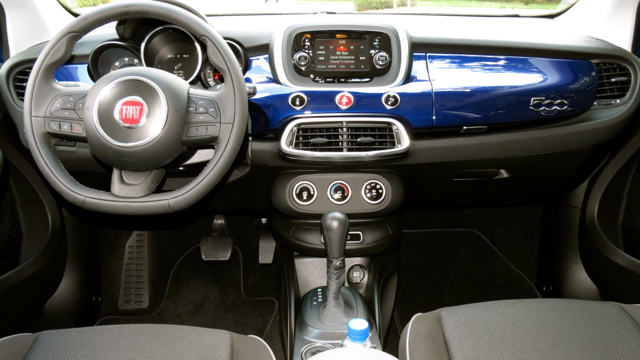 The subcompact SUV market is hot and the 2017 Fiat 500X finds itself in the thick of things. Mechanically similar to the Jeep Renegade, the 500X is outsold 10-to-1 by its FCA cousin, underscoring the relative and enduring anonymity of the Fiat brand. And that’s a shame as the 500X is probably the best kept secret Fiat wishes wasn’t concealed. Given my auto journalist soapbox, I’ll attempt to reveal its main attributes, while pointing out the obvious: a lot of Americans still don’t understand Fiat. 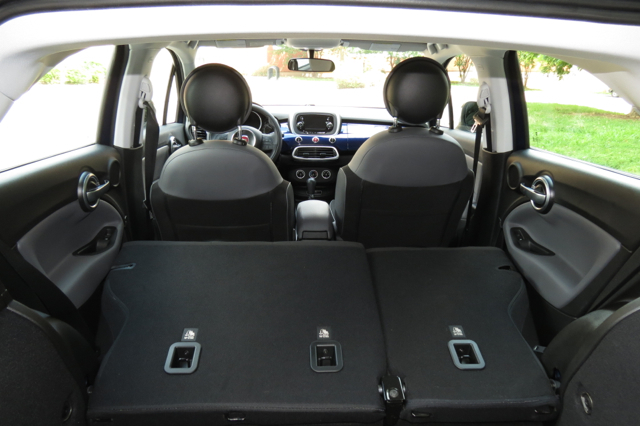 The 2017 Fiat 500X is available in three trims: Pop ($19,995), Trekking ($23,350) and Lounge ($25,150). Add $995 for destination and $1,900 for all-wheel drive on the Trekking and Lounge editions. This doesn’t mean you can’t get all-wheel drive on the base model, rather you’ll need to upgrade from the base 1.4-liter engine with a six-speed manual transmission to the much more common 2.4-liter four-cylinder engine with a nine-speed automatic transmission. In making the transition to AWD on the base model, your price rises by nearly $4,000 to $23,890. 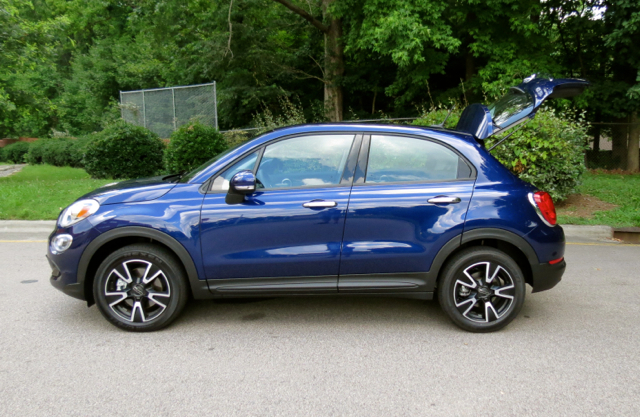 Fiat’s idiosyncratic style is all over the 2017 500X. From the front, the brand’s “happy face” is evident with the circular headlamps accented with LED lights and the narrow upper grille offset by “dimpled” fog lights. 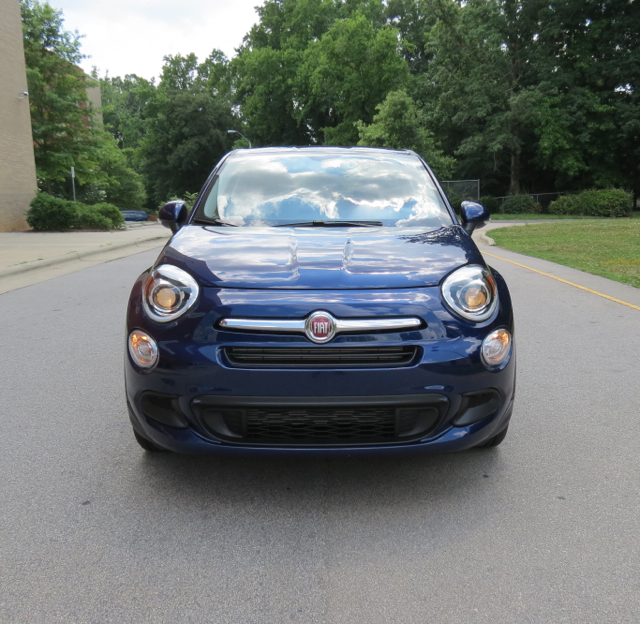 The large lower grille opening supplies a chin-like look and the chrome trim above the grille features the Fiat logo serving as the nose. Perhaps the 500X’s front fascia is too mortal for some? It is along the SUV’s sides where the demeanor transforms from a friendly face to a utility vehicle, most noticeably with its rising beltline, sweeping roofline, as well as its many character lines. 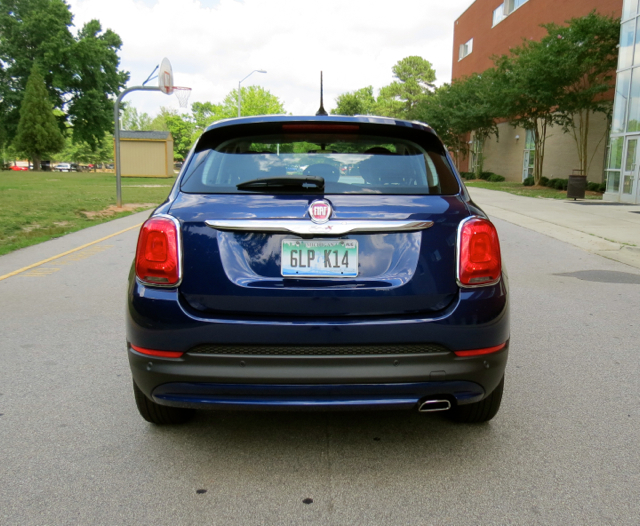 From the rear the fascia features oversized vertical tail lamps along with a spoiler, reflector lights, and chrome trim. 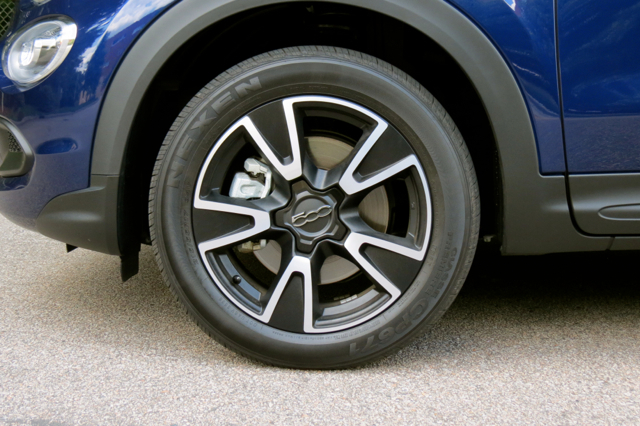 Wheel choices also add flair with an assortment of 16-, 17- and 18-inch designs available. Although small in size, the 500X’s wide stance signals a roomy SUV awaits. 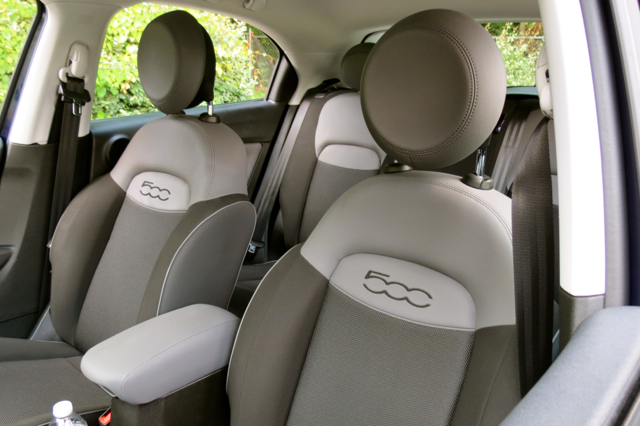 Just as the 500X’s exterior has its own take on Italian styling, the interior does likewise. You’ll find a circular theme throughout the cabin — on the door handles, across the dashboard, instrument gauges, switches and knobs and even the headrests. The design is modern and in some cases unusual — my test model featured blue plastic cladding across the lower dash, giving this model the “pop” worthy of its name. 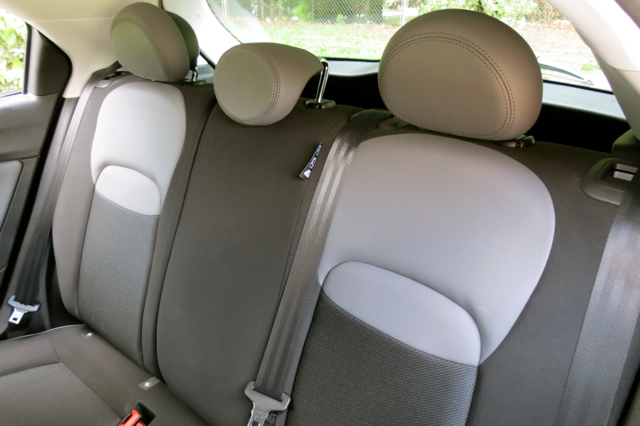 Premium cloth seats are standard; leather-trimmed seats are optional on the top-grade only. Behind the front bucket seats is a 60:40 split fold-down bench seat. Only that seat doesn’t quite fold flush with the floor. The Honda HR-V has a much better seat adjustment arrangement, making it possible to carry a bicycle inside. I imagine some people may find the interior room a disappointment, but let me say this: subcompact SUVs are ideal for two people. Anyone else you can fit inside is a bonus. Yes, up to three people can fit in the back, but if they’re adults, some shifting of the front seats forward may be necessary to accommodate their legs. A pair of car seats in the back or two older youngsters present should suffice. Standard equipment includes power windows and door locks, air-conditioning, and a tilt and telescopic steering column. Also available is dual-zone climate control, ambient lighting, cruise control, heated front seats, a heated steering wheel, and a power driver’s seat. All models come equipped with Fiat Chrysler’s voice-command UConnect telematics system. Base models have a five-inch touch-screen; all other models offer a 6.5-inch touch-screen. A standard four-speaker audio system gives way to six- or eight-speaker systems elsewhere. My test model had an eight-speaker Beats premium audio system. Satellite radio is standard across the model line as is Bluetooth. Available features include HD Radio, Siri Eyes Free, a navigation system with traffic reports and travel information. On the safety front, Fiat offers an advanced safety package on all but the base trim. Here, you’ll find: blind-spot monitoring and rear cross-traffic detection, full-speed forward collision warning with active braking, and lane departure warning with lane keep assist. 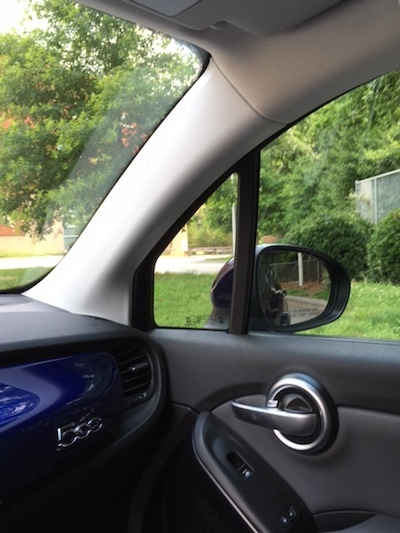 Parking assist and a rearview camera are other options. As for crash testing, the Insurance Institute for Highway Safety (IIHS) gives the 2017 500X a Top Safety Pick score. As for the National Highway Traffic Safety Administration (NHTSA), we’re awaiting those results. 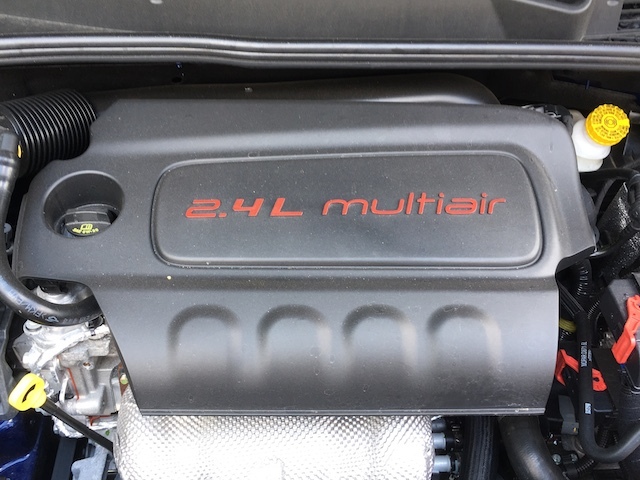 Fiat offers a 1.4-liter turbocharged engine standard and a normally aspirated 2.4-liter engine everywhere else. The turbo comes paired with a six-speed manual and is front-wheel drive only — this means most customers will shop beyond the base model. My test model had the larger of the two engines. I’ve driven several other Fiats (plus the 2016 500X), so I’m entirely familiar with both choices. The larger four works as you would expect, offering satisfactory off-the-mark acceleration and acceptable passing power. Not once did I have a “want” for more power. At the same time, my performance expectations were entirely in line with the vehicle at hand — a small SUV with adequate power. The Fiat’s steering and handling provide a measure of connectivity that should please most drivers. Steering is light to the touch, enabling tight turns as needed. This model handles well with surprisingly little pitching and yawing despite its raised profile. It doesn’t match the Fiat 124 Spider in that department, but then the Spider is really a Mazda and a sports car at that. As for braking, it is firm to the touch, bringing this SUV to a quick stop with very little fade of note. Do you need all-wheel drive? My test model was front-wheel drive and it provided the expected control. If you live in a mountainous area or where wintry weather annually sets up shop, then go with the four-wheel control. Otherwise, front-wheel drive is entirely suitable for this small SUV. 1), Fiat is a small car brand operating in a market where consumers have largely rejected such cars. In Europe, where small cars are still prized, the brand thrives. In the US, not so much. Fiat will likely always remain a small car brand, leaving the larger models to Dodge, Alfa Romeo, Jeep, and Ram. 2), Fiat remains relatively unknown. When Americans think of car brands, makes such as Ford, Toyota, Chevrolet, Honda, Dodge and Nissan quickly come to mind. Even among smaller mainstream brands Subaru, Buick, and Chrysler come to mind first. Fiat toils among bigger players because it isn’t a full line brand nor is it as established. 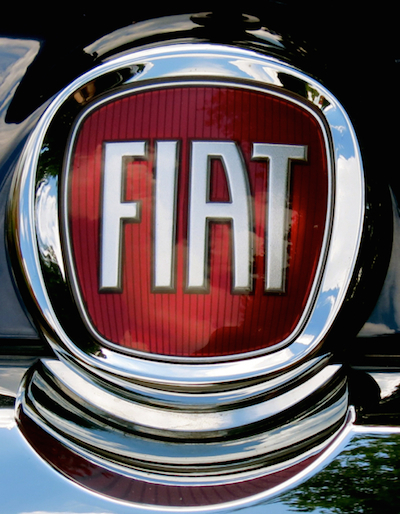 People who remember Fiat from long ago may still retain perceptions of the brand that only impacts their ability to give Fiat serious consideration. 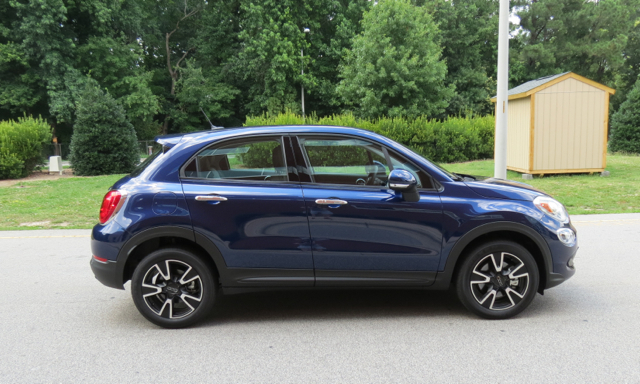 That said, if you are shopping for a small SUV, the 2017 Fiat 500X should be on your list. It offers much value in a segment where prices are rising as well as the discounting that makes purchasing or leasing one an enticing proposition for consumers.